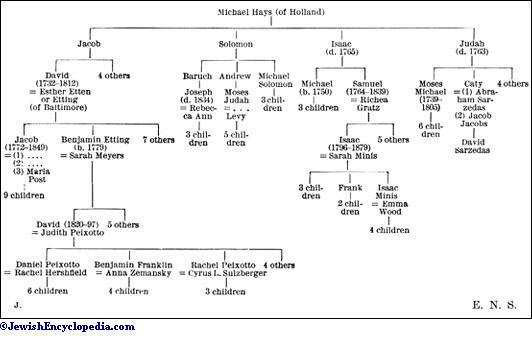 Family which emigrated from Holland in the first quarter of the eighteenth century and settled in and near New York city. Records exist of six brothers: (1) Jacob, (2) Judah, (3) Isaac, (4) Solomon, (5) Abraham, and (6) David, whose sons were identified with the colonial cause during the Revolutionary war, and whose descendants are scattered throughout the United States. Naturalized in 1723. 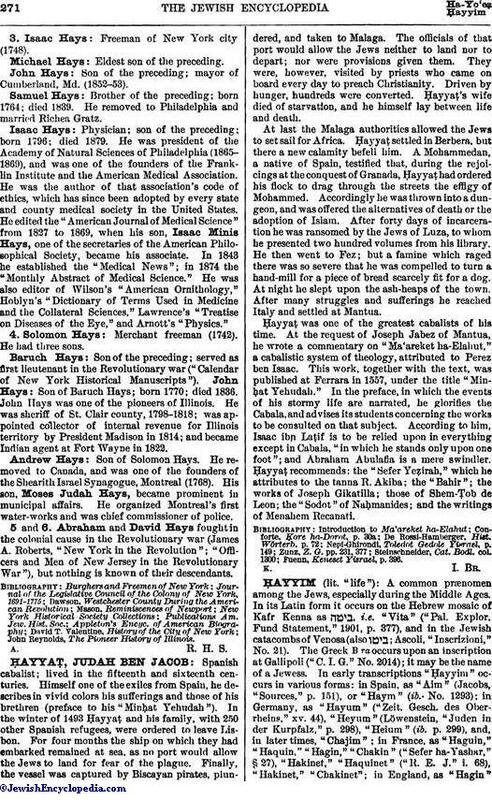 A record exists of the lease of property to him in Rye, N. Y., and his name appears among those active in erecting the first building for the Congregation Shearith Israel, New York city, in 1730. His sons were farmers in Westchester county, New York. Benjamin Hays: Member of Westchester County Militia (J. A. Roberts, "New York in the Revolution"). His house at Bedford, with that of David Hays, was burned during the Royalist raid upon that town in July, 1779 (Rev. Robert Bolton, "Hist. of the County of Westchester"). 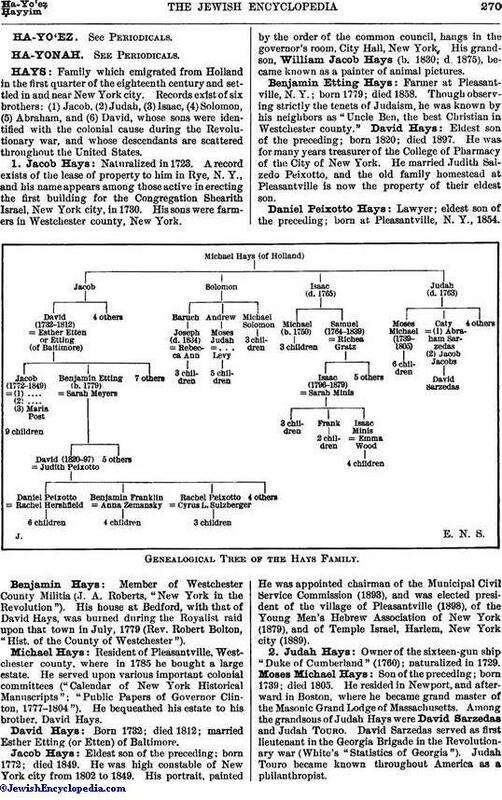 Michael Hays: Resident of Pleasantville, Westchester county, where in 1785 he bought a large estate. He served upon various important colonial committees ("Calendar of New York Historical Manuscripts"; "Public Papers of Governor Clinton, 1777-1804"). He bequeathed his estate to his brother, David Hays. David Hays: Born 1732; died 1812; married Esther Etting (or Etten) of Baltimore. Jacob Hays: Eldest son of the preceding; born 1772; died 1849. He was high constable of New York city from 1802 to 1849. His portrait, painted by the order of the common council, hangs in the governor's room, City Hall, New York. His grandson, William Jacob Hays (b. 1830; d. 1875), became known as a painter of animal pictures. Benjamin Etting Hays: Farmer at Pleasantville, N. Y.; born 1779; died 1858. Though observing strictly the tenets of Judaism, he was known by his neighbors as "Uncle Ben, the best Christian in Westchester county." David Hays: Eldest son of the preceding; born 1820; died 1897. He was for many years treasurer of the College of Pharmacy of the City of New York. He married Judith Salzedo Peixotto, and the old family homestead at Pleasantville is now the property of their eldest son. Daniel Peixotto Hays: Lawyer; eldest son of the preceding; born at Pleasantville, N. Y., 1854. He was appointed chairman of the Municipal Civil Service Commission (1893), and was elected president of the village of Pleasantville (1898), of the Young Men's Hebrew Association of New York (1879), and of Temple Israel, Harlem, New York city (1889). Owner of the sixteen-gun ship "Duke of Cumberland" (1760); naturalized in 1729. Moses Michael Hays: Son of the preceding; born 1739; died 1805. He resided in Newport, and afterward in Boston, where he became grand master of the Masonic Grand Lodge of Massachusetts. Among the grandsons of Judah Hays were David Sarzedas and Judah Touro. David Sarzedas served as first lieutenant in the Georgia Brigade in the Revolutionary war (White's "Statistics of Georgia"). Judah Touro became known throughout America as a philanthropist. Freeman of New York city (1748). Michael Hays: Eldest son of the preceding. John Hays: Son of the preceding; mayor of Cumberland, Md. (1852-53). Samuel Hays: Brother of the preceding; born 1764; died 1839. He removed to Philadelphia and married Richea Gratz. Isaac Hays: Physician; son of the preceding; born 1796; died 1879. He was president of the Academy of Natural Sciences of Philadelphia (1865-1869), and was one of the founders of the Franklin Institute and the American Medical Association. He was the author of that association's code of ethics, which has since been adopted by every state and county medical society in the United States. He edited the "American Journal of Medical Science" from 1827 to 1869, when his son, Isaac Minis Hays, one of the secretaries of the American Philosophical Society, became his associate. In 1843 he established the "Medical News"; in 1874 the "Monthly Abstract of Medical Science." He was also editor of Wilson's "American Ornithology," Hoblyn's "Dictionary of Terms Used in Medicine and the Collateral Sciences," Lawrence's "Treatise on Diseases of the Eye," and Arnott's "Physics." Merchant freeman (1742). He had three sons. Baruch Hays: Son of the preceding; served as first lieutenant in the Revolutionary war ("Calendar of New York Historical Manuscripts"). John Hays: Son of Baruch Hays; born 1770; died 1836. John Hays was one of the pioneers of Illinois. He was sheriff of St. Clair county, 1798-1818; was appointed collector of internal revenue for Illinois territory by President Madison in 1814; and became Indian agent at Fort Wayne in 1822. Andrew Hays: Son of Solomon Hays. He removed to Canada, and was one of the founders of the Shearith Israel Synagogue, Montreal (1768). His son, Moses Judah Hays, became prominent in municipal affairs. He organized Montreal's first water-works and was chief commissioner of police. fought in the colonial cause in the Revolutionary war (James A. Roberts, "New York in the Revolution"; "Officers and Men of New Jersey in the Revolutionary War"), but nothing is known of their descendants. John Reynolds, The Pioneer History of Illinois.